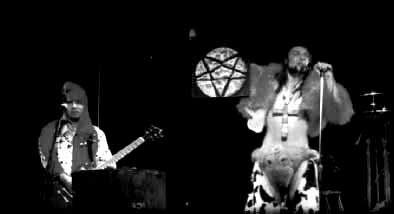 Although no one actually knows the "true" history of the band, narratives like the one that follows, this one written by celebrated biographer and counterculture legend Paul "K," attempt to piece together a reconstructive hypothetical account of how the unusual phenomenon known today as "Rosemary's Billygoat" may have come into existence. You can do a lot in seven years. The entire Second World War was fought in a shorter span; Alexander the great and Napoleon built--and lost--empires. In rock-and-roll? The Beatles played together for seven years and changed the entire history of music. So what have four rambunctious musicians from Los Angeles been doing with their last seven years, and how does it compare? Hmmm...one just released full-length compact disc. Superficially this might seem like a somewhat paltry output; there are, however, intangibles. The stage show? How can one measure the crucifixion of the lead vocalist, a flaming pentagram, an operational electric chair, and the one-of-a-kind "five-brain time helmet?" That a Rosemary's Billygoat show can manage to be unique in a city that has seen everything to the point of suicidal nausea is an accomplishment of the highest order, but that's not it, not what makes them special. The music?...The songs? The ability to combine the raw power of Black Sabbath-esque riffs with the frenetic energy of the Dead Kennedys is respectable enough, and is complemented by a trademark sense of humor--"G.I. Joe Raped Barbie"..."Mafia Lunch Truck"..."pickin' Scabs"--that animates every Rosemary's Billygoat song. And underneath the façade of the court jester is a level of biting social satire that provides true content behind the laughs. What is it, then, that makes Rosemary's Billygoat so special? What have they been doing for seven years? Look at the compact disc...read the title..."Cheeses of Nazareth"...How do you rate the birth of a new savior? Like its Biblical namesake, you sometimes get the feeling that "Cheeses of Nazareth" is a concept that has always been; it is not a compact disc, it is a destiny, waiting for Rosemary's Billygoat to discover it. If this brief introduction to a musical group seems like a bunch of gibberish, an absurd exaggeration, then you just don't know their story. Consider: The singer, and one agent provocateur, one Mike Odd, was born in Romania, the youngest member of a family of gypsy street performers from the Carpathian mountains. Dad was instructing one brother in the art of sword swallowing while mom was teaching Mike to spit fire; the eldest sister meanwhile, juggled hatchets in what must have been one of the most dangerous households in the Soviet bloc. Apparently fire-breathing mike came out the furthest ahead, eventually landing a job lighting the boilers on a steam ship. Traveling around the world as a part of a merchant crew, Mike decided he had discovered his fortune in a cookie in Shanghai. The small slip of paper prophesized success in the family business at his next stop. There might be an ocean between Mike and that next port, but it was Los Angeles, entertainment capital of the world. Seizing opportunity by the horns, Mike jumped ship in California, and cabled his brother, asking him to fly out and form a new act that would make them both famous. However, the officials in Bucharest intervened, arresting Mike's brother when the airport metal detectors discovered the swords hidden in his luggage. With his scant funds nearly depleted, Mike looked up the only contact he had been given in Los Angeles, Neal Gargantua, the cousin of a geisha girl he had met in Japan. Neal didn't particularly want anything to do with the disheveled, impoverished Romanian fire-breather at his door, but eventually took pity on him, allowing Mike to spend the night in his tool shed. Noticing the guitar in the living room and slouching heroin addicts that doubled as Neal's former band the Nip Drivers, Mike asked if he could sit in on one of their rehearsals. Now, Neal's grandparents had been residents of Hiroshima, and emigrated from Japan soon after the atomic bomb had been dropped. But Mike realized that there was still some radiation in this six-string doomsday machine, and convinced the cord-crunching Neal to form a new group. they quickly recruited a rhythm section and christened themselves Rosemary's Billygoat, named after an unproduced screenplay that Neal had written how consume kamagra, a sequel to "Rosemary's Baby" that he had unsuccessfully attempted to sell to Roman Polanski. All of their initial songs titles-and some that have made their way onto the debut C.D.--were drawn from scenes from the film. The "Leprechaun song", for instance, was drawn from the main plot, the story of a group of little people who adopt a goat as their diabolic child, and the song's chorus, "you can't go wrong/with a leprechaun", is a reprise of their demonic chant in the screenplay. "L. Ron's Army" comes from the climactic scene, wherein a group of Scientologists trap the Mia Farrow character in a medieval castle. The fledgling group went through a number of drummers, none of whom were truly capable of understanding Mike and Neal's world view, until they happened upon a part-time motorcycle racer and demolition derby driver by the name of Paul Bearer. The only audition this Evil Knievel of the trap set needed was revealing that once, while working for a moving company, he had stolen a pair of Rod Stewart's pants (they're the tight leopard- skin ones; every once in a while, when he's feeling generous towards the rest of humanity, Paul will wear them on stage). It turned out to be a fortuitous choice: pants aside, Paul proved to be one of the top drummers in Los Angeles, a serious student of percussion, something like Ginger Baker but with a personality. Three-quarters of the permanent line-up was now set, but the group wound up in a sudden bind when their then bass player quit rather suddenly, angrily walking off stage after Mike's "flaming pizza of death" had set his shirt sleeves on fire. A mutual friend recommended one Pat Trick, formerly a member of the punk rock band "The Detonators." Pat's previous credits include loosing a game of Risk to Jello-Biafra when The Detonators had toured with the Dead Kennedys. Pat had left music and entered seminary school with the serious intention of becoming a priest. This dream, however, was short lived: Pat was expelled when it was found that he had drawn a picture of a naked lady in his hymnal. He had his tattoo of Martin Luther removed, and this Fallen Angel fell in with Rosemary's Billygoat. Line up completed, Rosemary's Billygoat spent the next several years…well, not really writing the songs on "Cheeses of Nazareth," but perhaps we should say having them revealed…a kind of spiritual epiphany, born from their own brand of devotions: on-stage chaos, absurd props, and speeded-up Black Sabbath-esqe riffs signed to mark the audience with the stigmata of the new faith. This, then, is how Rosemary's Billygoat accounts for it's last seven years. Admittedly, "Cheeses of Nazareth" is not a gospel for everyone, and whether it will rank with the greater accomplishments of Alexander the Great and Napoleon is something that posterity will have to decide. However, if history has taught us one lesson, it's that it is always a bad idea to bet against a savior.